These Chicken Broccoli Cheese Baked Potatoes are a super easy and hearty dinner idea that the whole family can enjoy! The best part of these baked potatoes are that you can make them with leftovers from a meal earlier in the week, so one dish can pull double duty and you don’t have to spend nearly as much time cooking or cleaning up! When I was in college we had a restaurant near campus that just sold giant baked potatoes in tons of different flavors that were loaded with fixings. I used to get quite a few different flavors on rotation, but one of my all time favorites was always the one that was stuffed full of chicken, broccoli and cheese sauce. It was comfort food at it’s finest! Fast forward… um… a lot of years… and these are still something that makes a regular appearance at our dinner table. I have always loved the flavor of broccoli and cheddar and created this easy Chicken Broccoli Cheese Casserole that I like to whip up during the week for dinner. While this casserole is always a hit on it’s own, the real reason I make it is that the leftovers work like magic to make these same loaded chicken broccoli and cheese baked potatoes! That my friends is winning at dinner time! Making one meal and using it twice in two different ways to make two unique meals! This recipe uses 4 baked potatoes. To prepare the baked potatoes you can use whatever method you prefer or fits your schedule best! For each method I like to thoroughly wash the potatoes and pat dry, before starting. Then I pierce them 2-3 times with a fork, butter the potatoes, season with coarse salt and continue as directed. The cooking times below are for a small-medium potato. If you have large potatoes the cook time could increase. Crock Pot: Wrap potatoes in foil and cook them on high for 4-5 hours in the crock pot or until they are fork tender. Oven: This is the most traditional way and generally comes out with a great result. 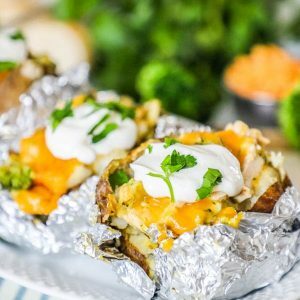 Wrap the potatoes in foil individually and them place them in the oven at 435˚F for 50-65 minutes or until fork tender. Pressure Cooker: Individually wrap the potatoes in foil, then place on a steaming rack in the pressure cooker with 1/2 cup water at the bottom. Cook on high pressure for 10-12 minutes. Quick release and test for fork tenderness. Microwave: Do NOT wrap in foil. Instead place potatoes in a microwave safe dish, then loosely cover with paper towel or lid and cook on high for 5 minutes, turn over and cook for an additional 5 minutes. Check for fork tenderness. I am going to walk through this recipe with you step by step here and share all of my notes, and preferences on how I make this. If you just want the quick version, scroll on down to the bottom of this post for a full printable recipe card. Hopefully this will address any questions you have, but if I leave any unanswered, please feel free to leave me a note in the comments! 4 small russet potatoes, baked- I use small potatoes because once you pile everything on, a small potato becomes a large meal! You can use bigger potatoes if that is what you have on hand, you will just have to adjust the toppings and portion them out. 2 cups Chicken Broccoli Cheese Casserole, prepared- This recipe is super easy to make and this is my favorite way to use the leftovers. You can actually freeze the leftovers too so that you can make this later on in the month if you want to spread your flavors a little bit more. If you don’t have this on hand, you can use the Campbell’s Broccoli Cheddar Condensed Soup and shredded chicken breast as an alternative. 1/2 cup sharp cheddar cheese- I like sharp cheddar cheese because it gives you more flavor with less. I feel like a sprinkle of this stuff can go a long way! If you are in a pinch and don’t have sharp on hand, you can go with medium or mild instead. 1/4 cup sour cream- Feel free to use light! Take the chicken out of the chicken broccoli cheese casserole and chop it into small bite sized pieces and then stir it back into the casserole. I like to make the pieces pretty small so there is less wrestling with it on the plate, but you can cut it into strips or however you think will serve best for your guests. Cut open and fluff each potato, season with salt and pepper to taste and place on a baking sheet. Then spoon on 1/2 cup of the chicken broccoli cheese casserole mixture over top of each one. Top each with 2 tbsp cheddar cheese. This really isn’t an exact science! I tried to give you my best estimation here of how I make them, but you can feel free to add a little more or a little less as you desire. These will come out great as long as the same general recipe is used! Place the potatoes in the oven on 400˚F for 8-12 minutes or until they are heated through and the cheese is melted. The potato should still be warm from baking, but this step helps to melt all of the cheese and heat the chicken broccoli cheese casserole that is added to it to make sure the entire dish is nice and warm. 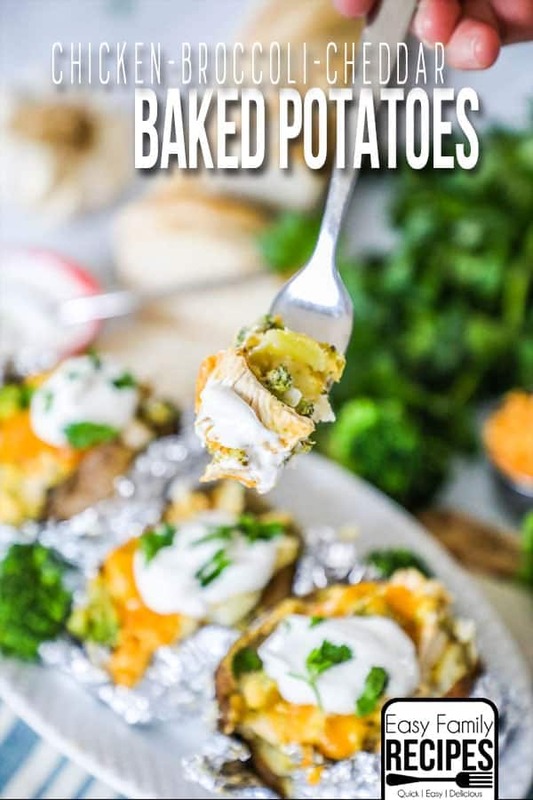 Remove from oven and top with a dollop of sour cream and garnish with parsley or any of your favorite potato toppings. Bacon or green onions would be a great addition too! Try making bacon in the oven then crumbling it on top. Yum! I hope this easy recipe is as loved by your family as it is by mine. If you do get a chance to try it and enjoy it, I would love to hear about it! Nothing makes me happier than hearing others make and love the recipes I share. You can leave a comment below or if you share a photo on Instagram, make sure and tag me @easyfamilyrecipes so I can see your creations! This meal is comfort food at it's finest! Tender chunks of chicken are smothered in cheddar cheese sauce and layered with broccoli florets to make the perfect meal sized topping for a baked potato. This filling meal will make everyone in the family happy from the oldest to the youngest! Take the chicken out of the chicken broccoli cheese casserole and chop it into small bite sized pieces and then stir it back into the casserole. Cut open and fluff each potato, season with salt and pepper to taste and place on a baking sheet. Then spoon on 1/2 cup of the chicken broccoli cheese casserole mixture over top of each one. Top each with 2 tbsp cheddar cheese. Place the potatoes in the oven on 400˚F for 8-12 minutes or until they are heated through and the cheese is melted. Remove from oven and top with a dollop of sour cream and garnish with parsley. Enjoy!